Consumer Action Law Centre has launched their latest election platform for this November's Victorian State Election which calls on our state politicians to create quick fair free justice access for all Victorians. "More than twelve months have passed since the release of the Victorian Parliament’s Inquiry into the Retirement Housing Sector that recommended the establishment of a Retirement Housing Ombudsman, yet older Victorians are no closer to seeing this critical reform. Older Victorians living in retirement housing want a quick, easy and low-cost dispute resolution option when problems arise, including unfair fees and bullying. We hope that most residents will never need this service, but all Victorians will benefit from an Ombudsman by rebuilding confidence and trust in the retirement housing sector." Victorian Civil Administrative Tribunal and Dispute Settlement Centre of Victoria announce an official partnership program between the two agencies. DSCV and VCAT will be enhancing access to justice for everyday Victorians through the Civil Mediation at VCAT program. "The program will expand into regional areas over the next four years, with the first region being Barwon South West which will include matters heard at Geelong and Warrnambool. Initially, the claim threshold for civil matters deemed suitable for mediation will be up to $3,000, gradually increasing over the four years to include matters up to $15,000. To support this, the listing of civil claims suitable for mediations will be expanded over time to five days per week. To contact the DSCV team at VCAT, please visit our contact us page, or email the team." The Dispute Settlement Centre of Victoria advises DSCV assisting in retirement village disputes. "DSCV will now provide appropriate dispute resolution services for retirement village residents or management who need assistance. Previously, Consumer Affairs Victoria provided a conciliation service for disputes between a resident and a manager, while disputes between residents could be taken to DSCV. Consumer Affairs Victoria will continue to educate retirement village operators and managers about their legal obligations, and address any breaches of the law. Residents and managers can still contact Consumer Affairs Victoria for information on their rights and responsibilities, including the steps they can take if there is a dispute. Consumer Affairs Victoria recommends that residents and managers should first try to resolve any complaint or dispute through the village’s internal dispute resolution scheme. For more information on legal obligations for retirement village operators and managers, visit the Consumer Affairs Victoria website. For information about the range of dispute resolution services provided by DSCV, visit our mediation page." YourLifeChoices reports ACCC retirement village probe stalls. "Almost nine months since the competition watchdog said it would investigate serious matters involving retirement village operator Aveo, it has still not asked a single question of the company, according to chief executive Geoff Grady. Mid-last year, ACCC chairman Rod Sims told Fairfax Media that there were three laws relevant for the commission to investigate: misleading conduct, unfair contract terms and unconscionable conduct. But he said the ACCC would need to unpick what the state requirements were doing." YourLifeChoices reports that two retirement village operators offer alternative contracts. 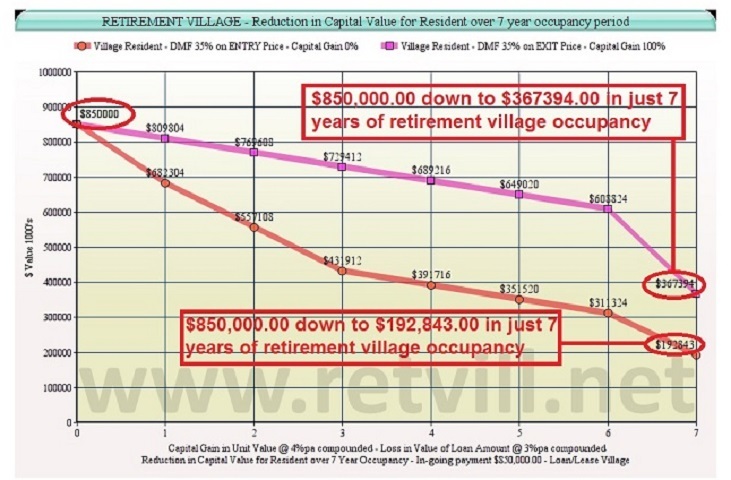 "During last year’s joint Fairfax/Four Corners reporting of alleged unconscionable conduct by Aveo, revelations surfaced about residents who said they had been ‘gouged’ by exit fees – otherwise known as deferred management fees – when they left the villages. In response to the fallout, Stockland and Lendlease, which between them own 136 retirement villages, have introduced a variety of new contracts, some of them without exit fees. Stockland Chief Executive of Retirement Living Stephen Bull told YourLifeChoices in a statement: “One of the key differentiators of our retirement living business is that we make it affordable to move in, and affordable to live in a Stockland retirement village." the Peace of Mind contract has a deferred management fee that maxes out at five years or 25 per cent of the initial price paid from the home. In addition, Stockland covers all renovation costs and residents will be repaid after a maximum of six months from departure even if their home hasn't yet been sold. the Capital Share contract offers the resident the opportunity to share in 50 per cent of the capital gain of the property. In this contract, the residents deferred management fee reaches its maximum at seven years or 35 per cent in total. the Aspire product, which will be offered at two villages currently under construction – one at Elara, in Marsden Park, Sydney and the other one is in our Calleya Community near Perth in WA. It has a higher entry fee, but no exit fees." A consumer driven retirement village reforms petition reaches first 100 signatures. Retirement village resident Les Scobie started an on-line petition to all governments pushing for meaningful reforms to retirement village laws throughout Australia. 1. Create greater fairness in the financial outcomes for residents for the provision of residential accommodation to older Australians. 2. Total revision of all Retirement Villages Legislation. 3. Easier access to the law for residents through the appointment of an industry Ombudsman. 5. Greater clarity as to who is responsible for ongoing costs. 6. Amendment to the legislated definition of a retirement village to enable occupancy by way of a Residential Tenancies Agreement. 7. Outlaw the Deferred Management Fee model where the in-going fee does not reflect a relevant discount to the asking price of a commensurate property within the general community. Having reached the first 100 signatures Mr. Scobie now wants to move to 200, 300 and beyond so as to send a firm message to both state and federal governments. Mr. Scobie has produced tables showing the potential devastating impact on the capital value of a retiree from living in a retirement village. Retirement Village Reforms Demanded is the theme of a short video produced to push for reforms to the retirement village industry. Thorough review of the retirement village legislation. Easier access to the law through the appointment of an Industry Ombudsman. Higher management standards through formal training. Better legal and financial advice. Mandate a 'residential tenancy' option. Pay As You Go – “Pay a monthly contribution rather than a lump sum management fee”. The detail on each plan. Average of 30-35% DMF on the resale price after seven years. 1-2% sales commission. $10-15,000 refurbishment fee with option to upgrade at between $50-70,000 to maximise resale price. Pay an upfront fee of around 18% and receive 100% of the sale value when leaving the village (less reinstatement costs, selling costs etc). For example, a $500,000 DMF home will cost $590,000 upfront. After 10 years if it sells for $1 million the departing resident will receive the $1 million. Roughly one in five customers have taken this option over the 12 month test. Pay a higher ingoing contribution and Lendlease will provide a ‘money back guarantee’ on a set amount when you depart. An example is a $500,000 home may have a $650,000 guarantee when you leave, paid within 60 days. There are no selling fees at the end but you do pay an upfront establishment fee of 3% ($15,000 in this example). In addition to certainty for the family on the cash settlement, there is the certainty of funding residential aged care. Developed for customers (and their families) who may not wish to sell the family home or are managing their investment income. Still under the Retirement Villages Act, they will receive a lease (currently five years) and pay rent with no upfront payment and no departure fee or payment. The rent will be above the local market, reflecting the community facilities enjoyed and management support. They will also pay the same ongoing fees as the rest of the village residents on top of their rental fees. The ‘pay as you go’ alternative is currently only available for serviced apartments during the test phase but is intended to be rolled out to the wider village home market." The Sydney Morning Herald reports:- An article by Rachel Lane from Aged Care Gurus on new retirement village contract options for Lendlease. "These new payment alternatives are more like the options you get when buying a mobile phone or a luxury car. Lendlease said it came up with the options by researching the market, including consumers who rejected the current offering. The feedback suggested that for some people a capital gain was important, others wanted certainty they'd get back what they'd paid, and a third group desired the ability to pay month by month. Lendlease will still offer its current contract, whereby you pay an ingoing price and when you leave you receive the sale price, less a deferred management fee of up to 35 per cent of the sale price, and any reinstatement fees and selling costs. The first alternative is a prepaid price whereby you pay the management fee upfront (about 18 per cent of the purchase price), you still pay reinstatement fees and selling costs at the end but you receive all of the capital gain (or loss). The next option is a refundable contribution whereby the amount you pay is refunded in full within 60 days of leaving. With this option a non-refundable establishment fee of 3 per cent is charged upfront. The final option is to pay as you go, whereby you pay a monthly charge and a security deposit equal to 24 months' “rent”. The security deposit is refunded to you within 60 days of leaving the village. There is an establishment fee equal to three months' rent. Currently this option is only available on serviced apartments." Read the full story here:- Doing the sums on Lendlease's new contracts"
Residents living in retirement housing who have problems with their managers may find it hard to get results. They may feel frustrated that complaints to Consumer Affairs Victoria go nowhere, that managers flout the law or trample on residents rights with no consequences. In this two hour workshop, residents will hear about the types of issues that can be taken to the regulator Consumer Affairs Victoria and the best way to make your complaint count. Haydn Raysmith Room Level 4, Ross House, 247 Flinders Lane, Melbourne. "Lendlease is breaking ranks with the other big retirement village operators to introduce payment options with no exit fees. Lendlease has now introduced a choice of four financial models at 15 of its 71 retirement villages, with plans to extend them across the board after market feedback. Lendlease would still offer its existing contract, whereby a person buys a unit then pays a deferred management fee at the end. The three new options include a pre-paid plan, a refundable contribution and a pay-as-you-go model." Andrews Government Inaction on Retirement Village Reforms - The Victorian Daniel Andrews government is dragging the chain with retirement village reforms. 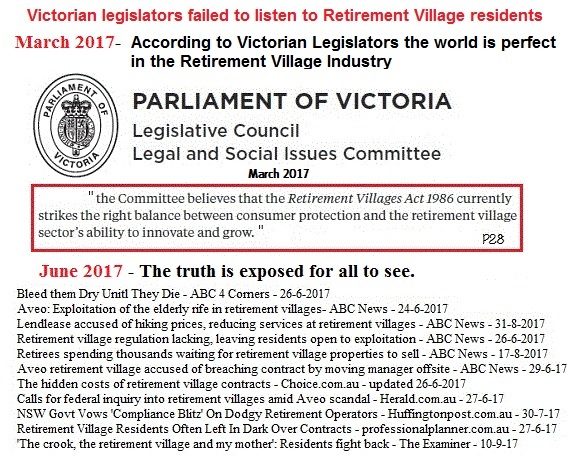 Despite a 2016 inquiry htp://www.retvill.net/vic-government, recommendations in early 2017 then a government response to the recommendations, no major action has been taken to reform retirement villages in Victoria. The inquiry, recommendations and response have been described as - left disappointed, no commitment, lost opportunity, evidence ignored, concerns dismissed, a damp squib, fillip to developers, brush-off to residents. The report of the Victorian Enquiry into the Retirement Housing Sector has proven to be a damp squib and disappointed many genuinely aggrieved Victorian residents of retirement villages. The enthusiasm with which it was greeted by the Property Council of Australia’s Victorian Division, when it was released on 7 March 2017, is a strong indication that it was a fillip to developers and brush-off to resident retirees. Advocate Launches Retirement Village Reform Petition - The Weekly Source reports. Banning the Deferred Management Fee (DMF) model where the in-going fee does not reflect a “relevant discount” to the asking price of a similar property in the community. " "Natalie Vernon was trying to enjoy a holiday in Tasmania last October when she received a call from her distressed daughter, informing her Mrs Vernon’s son was threatening to kill himself. “They didn’t know what to do ... I said give him a valium. PRN him,” she said, describing a medical treatment administered on a needs basis. “If it doesn’t work, he needs to be admitted. If you can’t manage him, you must take him to hospital."